Corona P (2010). Integration of forest mapping and inventory to support forest management. iForest 3: 59-64. Forest inventory and forest mapping can be considered as monitoring and assessment applications that respond to different demands. However, the integration of mapping and inventory provides an effective framework for the support of forest management from multiple perspectives: (i) use of thematic maps for stratifying the inventory sample for the purpose of improving the precision of inventory estimates; (ii) coupling remotely sensed and sample inventory data for the purpose of constructing maps of inventoried forest attributes; (iii) coupling remotely sensed data and sample inventory data for the purpose of improving the precision of the inventory estimates; (iv) using inventory data as prior information to support thematic mapping; and (v) using inventory data to correct map areal estimates. This paper aims to provide general considerations on this integration issue in the form of a scientific review and commentary discussion. Multiresolution segmentation: an optimization approach for high quality multi-scale image segmentation. In: “Angewandte geographische informationsverarbeitung XI beiträge zum AGIT-Symposium Salzburg” (Strobl J, Blascke T, Greisebener G eds). Herbert Wichmann Verlag, Karlsruhe, Germany. Design-based approach to k-nearest neighbours technique for coupling field and remotely sensed data in forest surveys. Remote Sensing of Environment 113: 463-475. Multi-resolution, object-oriented fuzzy analysis of remote sensing data for GIS-ready information. ISPRS Journal of Photogrammetry & Remote Sensing 58: 239-258. A forest typology for monitoring sustainable forest management: the case of European forest types. Plant Biosystems 1: 93-103. Introduction to remote sensing. Fourth Edition. The Guildford Press, New York, USA. Thematic maps and statistics. In: “Land cover and land use information systems for European Union policy needs”. Office for Official Publications of the European Communities, Luxembourg, pp. 219-228. Non-parametric and parametric methods using satellite images for estimating growing stock volume in alpine and Mediterranean forest ecosystems. Remote Sensing of Environment 112: 2686-2700. Valutazione dell’accuratezza tematica in cartografia forestale. L’Italia Forestale e Montana 3: 153-161. Stand-level forest type approach in Italy: experiences from the last twenty years. In: “Monitoring and indicators for Forest Biodiversity in Europe - from ideas to Operationality” (Marchetti M ed). EFI Proceedings 51: 143-152. Outlining multi-purpose forest inventories to assess the ecosystem approach in forestry. Plant Biosystems 141 (2): 243-251. Remote sensing support for post fire forest management. iForest 1: 6-12. Area-based lidar-assisted estimation of forest standing volume. Canadian Journal of Forest Research 38: 2911-2916. Sampling theory for forest inventories. Springer-Verlag, New York, USA. The roles of nearest neighbour methods in imputing missing data in forest inventory and monitoring databases. Scandinavian Journal of Forest Research 24: 235-246. Design-based and model-based inference in forest inventories. ISAFA Comunicazioni di Ricerca 2: 13-23. Two-phase estimation of coverages with second-phase corrections. Environmetrics 15: 357-368. A three-phase sampling strategy for large-scale multiresource forest inventories. Journal of Agricultural, Biological and Environmental Statistics 11: 296-316. A Bayesian approach to multi-source forest area estimation. Environmental and Ecological Statistics 15: 241-258. Estimation and mapping of forest stand density, volume, and cover type using the k-nearest neighbours method. Remote Sensing of Environment 77: 251-274. Remote sensing and land cover area estimation. International Journal of Remote Sensing 25: 3019-3047. Design-based and model-based inference in survey sampling: appreciating the difference. Canadian Journal of Forest Research 28: 1429-1447. Sampling strategies for natural resources and the environment. Chapman & Hall, New York, USA. Computer and robot vision. Addison-Weasley, Reading, UK. Forest inventory. Methodology and applications. Springer, Dordrecht, The Netherlands. New technologies and methodologies for national forest inventories. Unasylva 53: 10-15. Sampling methods, remote Sensing and GIS multiresource forest inventory. Tropical Forestry Series, Springer Verlag, Berlin-Heidelberg, Germany. A primer on stand and forest inventory designs. 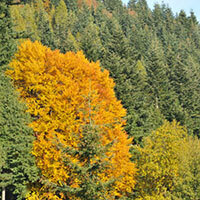 USDA Forest Service, General Technical Report WO-54, Portland, USA. A comparison of multipurpose resource inventories (MRIs) throughout the world. EFI Working Paper 14, Joensuu, Finland. Sampling techniques for forest inventories. Chapman & Hall, New York, USA. Estimation of Mediterranean forest attributes by the application of k-NN procedure to multitemporal Landsat ETM+ images. International Journal of Remote Sensing 17: 3781-3796. A comparative analysis of kNN and decision tree methods for the Irish National Forest Inventory. International Journal of Remote Sensing 19: 4937- 4955. A model-based approach to estimating forest area. Remote Sensing of Environment 103: 56-66. A two-step nearest neighbours algorithm using satellite imagery for predicting forest structure within species composition classes. Remote Sensing of Environment 113: 532-545. Diagnostic tools for nearest neighbors techniques when used with satellite imagery. Remote Sensing of Environment 113: 489-499. Satellite image-based estimates of forest area for international reporting. In: Proceedings of the “International Symposium on National Forest Inventory”, Koresa Forest Research Institute, Korean Society of Forest Resources Measurements, Yangyang, South Korea, pp. 3-12. Using a land cover classification based on satellite imagery to improve the precision of forest inventory area estimates. Remote Sensing of Environment 81: 36-44. Using satellite imagery as ancillary data for increasing the precision of estimates for the Forest Inventory and Analysis program of the USDA Forest Service. Canadian Journal of Forest Research 35: 2968-2980. Remote sensing support for national forest inventories. Remote Sensing of Environment 110: 412-419. Estimating areal means and variances of forest attributes using the k-nearest neighbours technique and satellite imagery. Remote Sensing of Environment 111: 466-480. Use of generalized linear models and digital data in a forest inventory of northern Utah. Journal of Agricultural, Biological and Environmental Statistics 4: 372-390. Combining remote sensing and field data for deriving unbiased estimates of forest parameters over large regions. In: “Advances in forest inventory for sustainable forest management and biodiversity monitoring” (Corona P, Koehl M, Marchetti M eds). Kluwer, Dordrecht, The Netherlands, pp. 19-32. Improved forest statistics from the Swedish National Inventory by combining and optical satellite data using post-stratification. ForestSat 2005, Boras, Sweden, vol. 8a, pp. 22-26. Perspectives on large-scale natural resource surveys when cause-effect is a potential issue. Environmental and Ecological Statistics 4: 167-180. Model-assisted estimation of forest resources with generalized additive models. Journal of the American Statistical Association 102: 400-416. ASPIS, a flexible multispectral system for airborne remote sensing environmental applications. Sensors 8: 3240-3256. Use of LIDAR for forest inventory and forest management application. In: Proceedings of the “Seventh annual forest inventory and analysis symposium”, Portland, ME (McRoberts RE, Reams GA, Van Deusen PC, McWilliams WH eds). Gen. Tech. Rep. WO-77, USDA, Forest Service, Washington, DC, USA, pp. 193-202. Remote sensing of upland conifer plantations using Landsat TM data: a case study from Galloway, south-west Scotland. International Journal of Remote Sensing 21: 633-646. Small area estimation. Wiley, New York, USA. Recent progress in digital photogrammetric stereo cameras and data evaluation. Springer, Berlin/Heidelberg, Germany. Model assisted survey sampling. Springer-Verlag, New York, USA. Sampling methods for multiresource forest inventory. Wiley, New York, USA. Forest type classification improvement using spatial predictive distribution models. In: Proceedings of the “21st International Symposium on Remote Sensing of Environment”. St Petersburg (Russia). Model-assisted estimation as a unifying framework for estimating the area of land cover and land-cover change from remote sensing. Remote Sensing of Environment 113: 2455-2462. Accuracy assessment. In: “The SAGE handbook of remote sensing” (Warner TA, Nellis MD, Foody GM eds). Sage Publications, New York, USA, pp. 297-309. Spatial interpolation of in-situ data by self-organizing map algorithms (neural networks) for the assessment of carbon stocks in European forests. Forest Ecology and Management (in the press). A methodology for forest inventory using GIS techniques for carbon sequestration analysis in the Río Grande de Arecibo watershed. American Society of Agricultural and Biological Engineers, Annual Meeting, Paper no. 045003, St. Joseph, Michigan, USA. Simultaneous use of Landsat-TM and IRS-1C WiFS data in estimating large area tree stem volume and aboveground biomass. Remote Sensing of Environment 82: 156-171. The role of remote sensing in global forest assessment. A remote sensing background paper for Kotka IV expert consultation. Kotka, FAO, Rome. Predicting categorical forest variables using an improved k-Nearest Neighbour estimator and Landsat imagery. Remote Sensing of Environment 113: 500-517. Establishing forest inventory reference definitions for forest and growing stock: a study towards common reporting. Sylva Fennica 42: 247-266. Remote sensing of forest environments: concepts and case studies. Kluwer, Dordrecht, The Netherlands.